Our last Open Morning gave prospective parents an opportunity to look around the School and we were pleased to see so many new faces. However, there is much more to Open Mornings than just showing off the School and what it has to offer. For our tour guides it is an opportunity for them to develop their communication skills and their self-confidence. Prospective parents are always very complimentary about those who showed them around and I thank all those involved for their contribution to a very successful morning. Open Mornings allow teachers to demonstrate the work that has taken place in their classroom. 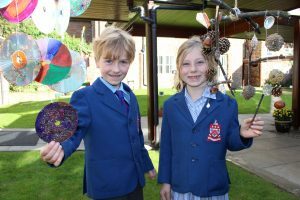 The Nursery and Infant School courtyard was decorated with some wonderful wind chimes and insect hotels. The Prep & Senior School history department displayed the results of its investigation into the decomposition of objects, buried in the school grounds, as part of a project on artefacts from the Roman fort at Vindolanda. Meanwhile the science department turned itself into a crime scene where our young visitors were asked to become forensic scientists and work out who had committed a murder! Open Mornings also allows teachers to show off their latest acquisitions. 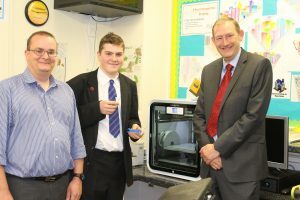 Mr Wilkinson was busy demonstrating the 3D printer that the School has recently purchased, with chess pieces and key fobs being carefully built up a layer at a time. Over in the Nursery and Infant School current parents attended a talk on phonics given by Miss Dring. This follows the talk given earlier in the year, on maths, by Miss Thompson and is part of a series of presentations on various aspects of teaching being given by staff. Later this term Mr Heaton will be discussing KS2 maths with parents of pupils at the Prep & Senior School. The feedback from these talks has been very positive, giving parents a greater insight into what their child/children is being taught and just as importantly how it is taught.